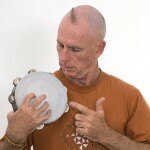 Greg Sheehan is one of Australia&apos;s premier and most innovative percussionists widely regarded internationally as a leader in his field. As a performer, he is significantly represented in the last three decades of Australian contemporary music as both a live band member and studio musician on hundreds of recordings. Greg has created a melody from the first 8 numbers in the Fibonacci sequence and performs it in the Concert Hall of the Sydney Opera House for TEDxSydney 2013.